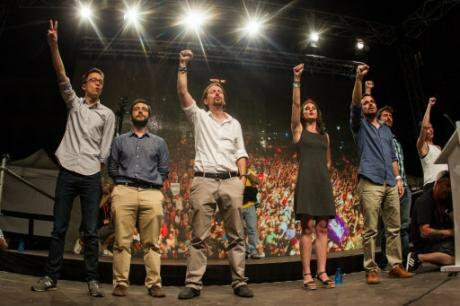 Unidos Podemos: Errejon, Bustinduy, Iglesias, Montero, Garzon, Mayoral, Bescansa after the results of Spain's national elections in June, 2016.Jimenez Rodrigo/Press Association. All rights reserved.Following decades of social mobilization throughout the 1990s and 2000s premised on the idea of “changing the world without taking power”, through building progressive alliances in autonomous spaces, at a distance from the state, the emergence of 15-M in spring of 2011 placed the unique character of the post-Franco ‘78 regime firmly on the table. This movement brought to a popular and global consciousness not only the deep and damaging social effects of the economic crisis in Spain, but a considerable political and regime crisis. Both mainstream political parties (PP and PSOE) and the entire political class were duly charged with a complete inability to represent the people so mobilised (No nos representan). In this way 15-M had the dramatic effect of reconnecting the question of institutional change with social transformation. It aroused the desire to make institutions work in the interest of a social majority. The emergence of Podemos in January 2014, and its surprising success in the 25 May European elections, were seen as the long-awaited arrival of a project committed to channelling the transformative spirit of 15-M into the institutional arena. Podemos’ European elections program combined anti-austerity proposals with a critique of “bipartisanship” to produce one of the most ambitious political programs it had formulated. The unexpected electoral success and freshness of the message generated a wave of optimism that culminated that summer with the creation of nearly 1,000 local and sectorial assemblies (circulos) across Spain. This early phase was characterized by a lack of formal representation, a horizontality and decentralization, which saw the assemblies (some naturally developed out of the neighborhood assemblies that came out of 15-M) functioning completely autonomously. This movement phase of the party came to an abrupt end at the first state-wide assembly in Vistalegre (I) in October 2014, where the formalization of the party’s structure became imperative and a choice between models necessary. The model of the party-movement, supported by Pablo Echenique and the anticapitalitas, proposing a more horizontal formation, was defeated in the face of a united effort from the main leading figures around an alternative. A more centralized and hierarchical proposal, supported by both Iglesias and Errejón, built on the latter’s hypothesis of the electoral war machine, which placed the question of structure and efficiency before that of internal democracy. This won out with an overwhelming majority (80.7%). Faced with a rapid sequence of local, autonomic and general elections, this majoritarian current justified a more centralized structure as better suited to maintaining consistency, and able to respond more rapidly to the complex game of electoral competition. With their eyes firmly set on winning the general elections, this short-term, blitzkrieg strategy of electoral assault determined a series of key decisions: embracing transversality over a more left-identifiable program of social demands; reduction of politics to the electoral contest; a head-on confrontation with the Popular Party and adoption of the rhetoric of war; a self-imposed insulation from social movements and the attempt to bypass social conflict in proposals and programs. In short, organisational and communicative verticality. The effect of these decisions was the subordination of the local assemblies and other structures to the centre and increasingly vocal discontent among the broader social movements in favour of a more bottom-up strategy and a broader understanding of politics and social transformation. This exclusion of plurality made unfeasible the development of effective counter-powers capable of counteracting the pernicious influence of oligarchic tendencies within the party’s organisation (illustrating the “iron law of oligarchy”). In our previous oD series on Podemos we looked, among other things, at the resistance to this process of centralisation and loss of internal democracy from both the rank and file and social movements. The sense then was that the undemocratic “deal” of Vistalegre I was only ever accepted on the premise of a contract: handing over to the centre the strategic and communication initiative in exchange for a win. But the electoral success never arrived, in 20 December 2015 or 26 June 2016. That devolution of power has yet to take place. So we arrive at the second state-wide assembly of Podemos, taking place next weekend, 11 and 12 February, in Vistalegre (II). The question that this assembly puts on the table is that of the continuing suitability of a structure created to fight in electoral wars for the new political cycle of both institutional, parliamentary opposition, and necessary re-vitalisation and engagement with the party’s base. It is also a chance for a collective reflection on the previous model’s success (given its costs). There’s a declarative consensus, from all sides of the debate, that a new model for the new cycle is needed, and that a level of internal democracy and decentralization needs to be restored. But it is hard to imagine in practice what this entails from the debates so far. The interventions collected here illustrate the positions of three of the main currents in Podemos today: the sector around Iglesias, the group around Errejón and the anticapitalistas. We have also invited contributions from the wider social movements, such as the municipalist movement, as their plans and their impact are often deeply felt within the party. The main difference between the assembly two years ago and today is that Iglesias and Errejón are leading two different sets of documents and candidates’ lists: Podemos for All, supported by the former, and Recovering Illusion, promoted by the second. This schism between the two most visible figures has recently taken on intense manifestations in the media and social networks in Spain, with both declaring the vote decisive for who will end up leading and continuing to shape the direction of the party. This may create the suspicion that Podemos’ leading project has always had at least two visions which coexisted only through a considerable effort on both sides, united by the imperative of “winning” alone. A recent vote on the procedures for next weekend gave Iglesias’ proposal a very narrow victory, indicating a split vote and the open-ended nature of next weekend’s proceedings. Our contributions to openDemocracy over the following four days offer a glimpse into this key debate and show what is at stake in Vistalegre II: the collective capacity to build unity from within a plurality of visions; or the distinct possibility of further division, disenfranchisement and even fragmentation. The main question is: will Podemos find the right model to continue to be a determining political force for change in Spain, able to mobilise the social majority? Or will it turn into an ABC that is beginning to miss some of its key letters? The membership will decide this week. Tuesday’s trio of viewpoints asks on what basis should Podemos approach the new post-electoral, political cycle? Podemos’ relation to the post-Franco ’78 regime. This discussion raises fundamental questions about the terrain of the political battle, the nature of the forces opposed and the forms of organisation needed. The debate is structured by a series of key contrasts between the three most visible sectors (around Errejón, around Iglesias and anticapitalistas). The key terms are: middle class vs. working class; consensus vs. conflict; relying on a plural language vs. using more left-identitarian markers; simple “opposition to the PP” vs. “opposition to the ‘78 regime”; institutional work vs. social mobilisation and “recovering the streets”. The first group embraces the first series of terms, while the latter two espouse the second series of terms, but differ on the specific weight and articulation of those elements considered necessary for a successful social transformation. Wednesday, we ask: Can the party be democratized at the upcoming party congress (Vistalegre II)? If so, how? The week’s decisions have huge implications for the way the party will be organised for years to come. Here the key debate is between the Errejón sector’s thesis of “winning normality” and the movementist idea of opposing the exceeding focus on governance and institutional management with an agenda for creating a counter-power and deepening democracy at the local level. Given the difficulty in reversing Vistalegre I, some contributions question any possibility of democratizing Podemos in this week’s process. Thursday tackles: How to expand Podemos’ social base? The very fact that this question is being asked accepts not only how detrimental the electoral war machine was to Podemos’ internal democracy, but how isolated both leadership and the party itself became, once separated from its wider social base. All contributions seem to agree that an expansion of the social base is necessary while they diverge over their understanding of where this expansion should be and what are the necessary means of reaching “those who are still missing” without losing “the ones that are already there”. Are those likely to be attracted to the political centre, or those on the progressive left, the ones to be pursued? Should the mothers and the elderly, the people in the rural areas with their specific realities, or those who “were once there” but were driven away by a strategy of centralisation and moderation come first? Will they be won by a discourse of moderation, or by stressing the social demands that must produce antagonism and even fear across the body politic? Can this social base be reached single-handed, or only by building alliances with other transformative forces? The final selection this coming Friday looks at: What communication strategies are needed for this new, post-electoral cycle? Podemos has always been leading, and praised for, their innovative communications developed on the basis of different interpretations of populism. Contributors on Friday look at the options: appropriating the “winning signifiers” by expressing a proposal for an open identity; reforming the media system to promote independence, pluralism, transparency, professional empowerment, community media and cooperatives; or taking into account the current limitations for the successful implementation of a communication strategy based on an integrative diagnosis and narrative. Is any of this now even possible ? Joan Pedro-Carañana and Simona Rentea (editors) would like to thank Livia Gasparini, Katherine García, Lucas Asnis, Lucía Sendargorta, Sofía Blanco, Elan Pinedo, Pato McKelligang and Pedro Candela for their help and support with putting together this selection.